Regardless of your business, profession or career choice, one of the biggest mistakes I have seen most professionals make when they first meet someone is not putting in the extra effort to look professional. Barring impromptu meetings, scheduled client and prospect meetings possess numerous mental and physical issues -- issues that can be overcome. To that end, we have prepared six tips below to help make your next first impression one of your best first impressions. 1. Dress To Impress: As cliché as this saying has become, it still holds true in today's society -- your clothes, your hair and your hygiene are all factors that most people will base their initial judgment on. While it is true that the workplace is becoming more casual and less stringent about dress codes, it is always a safer bet to overdress. You can always leave the jacket behind, ditch the tie, loosen a few buttons and roll up your sleeves if you find yourself entering a more casual setting. 2. Listen Attentively: First impressions are not one-sided interviews. They are opportunities for whoever you are meeting to gauge just how quick you are on your feet and how genuine your interest is. Drifting thoughts or distant gazes tell a speaker that your attention is elsewhere, which is not only insulting but also leaves a poor first impression. Be sure to nod along with certain points and respond with short phrases like "I agree" or "Hmm" to show you are participating. These conscious efforts will act as anchor points that keep you locked down in the conversation. 3. Use A Person's Name: Another way to show that you are paying attention as well as help learn and memorize a person's name is to use the person's name when asking them a question. Each time you include a listener's name you establish certainty of your participation in the discussion, personalize the moment and help make yourself more memorable in the process. 4. Be Articulate: For some, speaking articulately comes naturally. For others, it takes careful, conscious effort. And you know what? There's nothing wrong with that. It is better to pause and think carefully for a moment about what you want to say than to just blurt out the first words that pop into your head, especially if they are incoherent and easily misunderstood. Clear, concise communication is valued in the business world, so maintain a moderate pace while speaking, properly modulate your voice and enunciate your words. 5. Skip On The Humor: As tempting as it may be to slip in a bit of humor or crack a joke during a first meeting or call, don't. It's one thing to be light-hearted, but humor is a fuzzy area. What one person perceives as an innocent thought or comment another might perceive as ignorant, racist, sexist, homophobic, classist or just plain rude. And if you actually manage to say something misconstrued as any one of those previously mentioned faux pas during your first impression you can pretty much kiss your chances goodbye. 6. Don't Call Someone "Man, Bro, Girl, Gal, Pal Or Buddy": When you are speaking with a client, prospect or referral source (or for that matter your boss), especially one you have only just become acquainted with, make every effort to avoid using informal, intimate nouns such as "man, bro, girl, gal, pal or buddy." This is the language of friends or close acquaintances, not professionals doing business. Executive Summary: It doesn't matter if you are a recent hire or the new CEO for some Fortune 500 company -- the first impression you make is going to be what defines you AND your business. 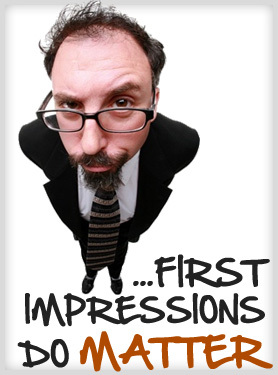 To ensure your first impression goes smoothly follow these tips and you will be well on your way to greater success.